Students Ben Davant, left, and Mike Podgajski shape the final plank for the pilot gig. Photo courtesy of the Great Lakes Boat Building School. In the tiny eastern Upper Peninsula town of Cedarville — population, 253 — a small group of students is working on a project for the U.S. Navy. As unlikely as that might sound, it is equally remarkable and true. 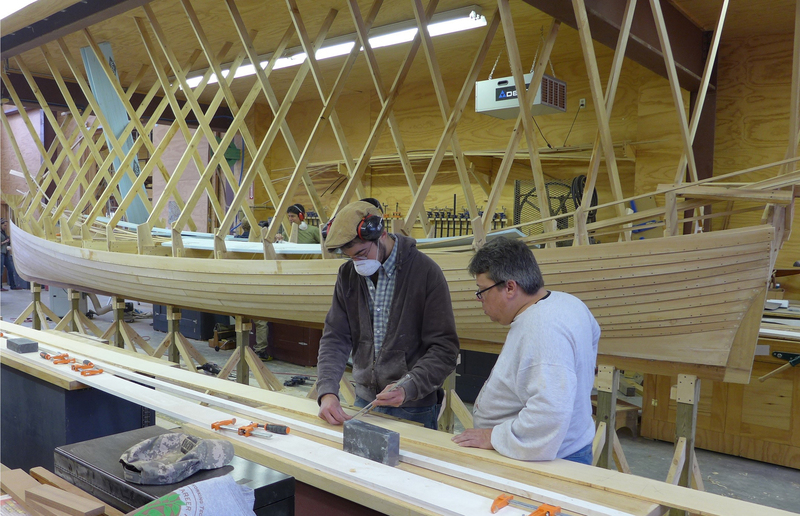 They are first-year students at the Great Lakes Boat Building School, a private institution that teaches the essentials of wood boat building to young and older students who want to pursue careers in that field. This is the second time in three years GLBBS students are building something of national significance. This season, they are working on a 32-foot Cornish pilot gig for the USS Constitution, the oldest ship in the U.S. Navy — and oldest commissioned naval vessel afloat in world. The 304-foot, three-masted wooden frigate was launched in 1797. It was named by George Washington himself. The U.S.S. 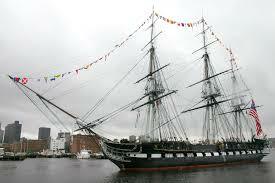 Constitution is the oldest ship in the U.S. Navy.Washington himself. The gig is expected to be completed soon. It will be transported in June to the 23rd annual Wooden Boat Show in Mystic Seaport, Connecticut. Then, it will be delivered to the Constitution’s captain and crew in Boston. A pilot gig is rowed by six oarsman and coxswain who steers. Photo: Great Lakes Boat Building School. 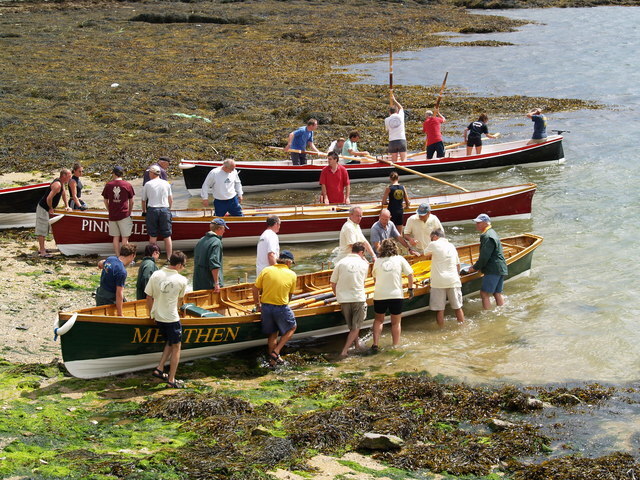 Cornish pilot gigs are 32-foot wooden rowing boats, powered by six oarsmen and a coxswain who steers. Historical records show they were used in the late 17th century for shore-based lifesaving efforts and as work boats. Gigs were developed in Cornwall, a peninsula in Southwest England. They were used in the 18th century to ferry pilots out to incoming sailing ships. Each new arrival from some distant port would prompt a race by area pilots out to the ship. The first to arrive and get onboard had the best chance of getting the job of piloting the large vessel into harbor and through known underwater hazards. That spirit of competition remains today among Cornish pilot gig enthusiasts, the members of competitive rowing clubs around the world. “This project is based on the Cornish pilot gig Treffry,” Mahon said, referring to the style built on the Cornish coast in 1842, today the template for many rowing club gigs. Pilot gigs being launched for a regatta in the U.K. Photo: Wikimedia Commons. ship is in dry dock being restored. Eleven first year students are working on the project. They started in January. 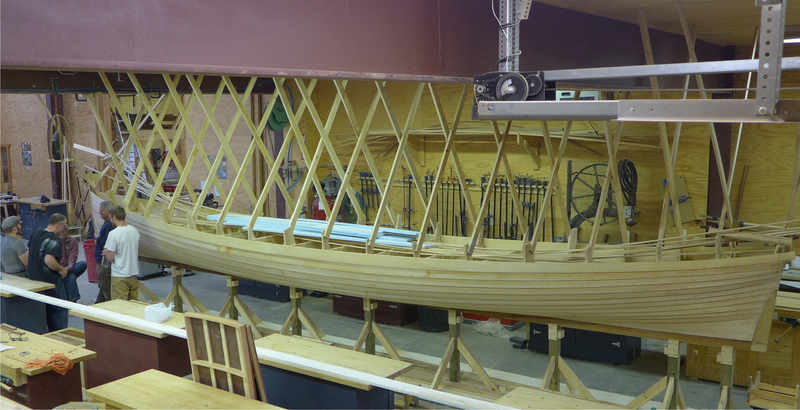 GBBS students build a variety of wooden boats, not all of which have historical significance. What they learn, however, allows them to build their own or go to work for wood boat builders or marinas as wood boat specialists. Two years ago, the school’s students built a traditional whale boat replica for the 133 foot Charles W. Morgan, the last of the wooden U.S. whaling ships. The ship was being restored at the Mystic Seaport Museum and since has been launched. First- and second-year students worked on the whale boat. It was one of seven commissioned by the museum for the Charles W. Morgan, which was launched in 1841 in New Bedford, Massachusetts. The excellence demonstrated in the whale boat project led to the current pilot gig commission, according to GLBBS staffers. An honor, to say the least, but also a reflection of the caliber of training aspiring wood boat builders get in the tiny town of Cedarville at the school — all of which should be a source of pride for the state of Michigan. This column appears in Mlive Media Group newspapers and MLive Outdoors. This entry was posted in Uncategorized and tagged Boat building, Boats, Cedarville, Cedarville Michigan, Great Lakes Boat Building School, U.S.S Constitution. Bookmark the permalink.